Jeff returned to Haiti for IBC’s second pastor’s conference in six months. 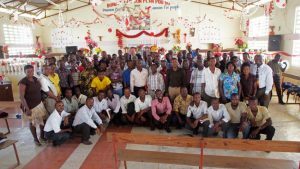 Preaching in Colossians helped us establish strong relationships with and gain the confidence of Haitian church leaders. Though many Haitian pastors have received excellent Bible training, they continue to hunger for Bible exposition. These indigenous pastors have helped rebuild their country after the Earthquake of 2010 and envision transforming the culture and worldview of their nation by the proclamation of the Word of God.